I had to put on a dress to go with this one: lambswool, made in Hong Kong, with hand-sewn beadwork all over it and hooks and eyes (also sewn on by hand) instead of buttons. How many hours of labor went into this one? I don’t have a clear memory of my mother wearing it, though I know she must have, to a wedding or other special occasion. More delicate, more feminine, than most everything I wear–aside from skating dresses. 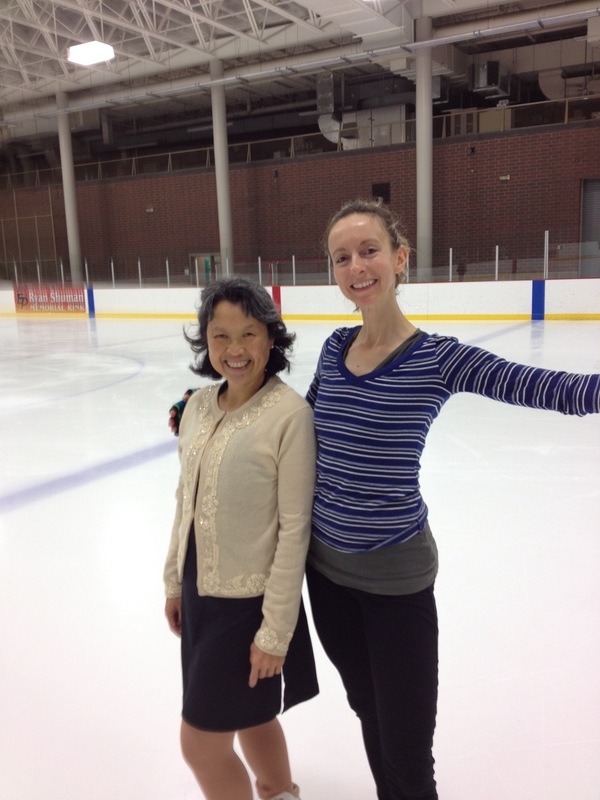 Had I skated as a child, my mother would have enjoyed seeing me in so many fancy dresses. I was, I’m afraid, a bit of a tomboy, the youngest of three daughters and the one most resistant to dressing like a girl. She made me wear a white dress with puffy sleeves and petticoats for my first fourth-grade band concert; it made me feel like a cream puff. Then she gave up. Wool and synthetic clothing aggravated my childhood eczema, so she allowed an all-cotton wardrobe. I favored denim everything, faded sundresses, polo shirts paired with corduroys and khakis in dull colors. Even as an adult I remember her saying “Are you going to wear THAT?” as I headed out to a conference in a too-casual shirt and pants. My chosen sport was gymnastics, where even the prettiest leotard was soon covered in chalk dust and streaked with sweat; I later took up running, which meant more sweatshirts and t-shirts (this was the era before bright colors and neat-fitting running clothes). My desire for cotton and comfort was compounded by feminism, which I mobilized out of pure self-interest to justify wearing the most comfortable clothing possible. I remember arguing with my sister over whether buying lingerie with scratchy lace on it constituted a form of ideological gender oppression (not in those terms, but you get the drift). Ordering dresses sight unseen, worrying about whether or not said dresses would arrive in time, returning them after they didn’t fit: this has been a crash course in why people spend the money to go custom. I have not yet done the custom dress route myself, but have rediscovered some sewing skills I had not used in a long time. I have also changed my take on lace, sequins, beads, ruffles, and other decorative touches. I used to dismiss them as not my thing, but now I can see how they change the entire look of my movement on ice, sometimes subtly, sometimes dramatically. And perhaps just as importantly, they change the way I feel while I’m skating, and it’s by no means oppressive. I would not feel diminished without them, but they do help me get into character and feel more brave and beautiful. These are special clothes–somebody put a lot of work into them so that they would look a certain way, and I take all of that care out with me onto the ice. Marion died last year, and I miss her lovely smile and her greeting: “So how is Jo today?” Looking at this sweater, I am reminded of her as well as my mother: beautiful women who never shied away from beads, color, glitter, and a ruffle–or two–for that special occasion. Voila! La plus belle Sonia avec moi. 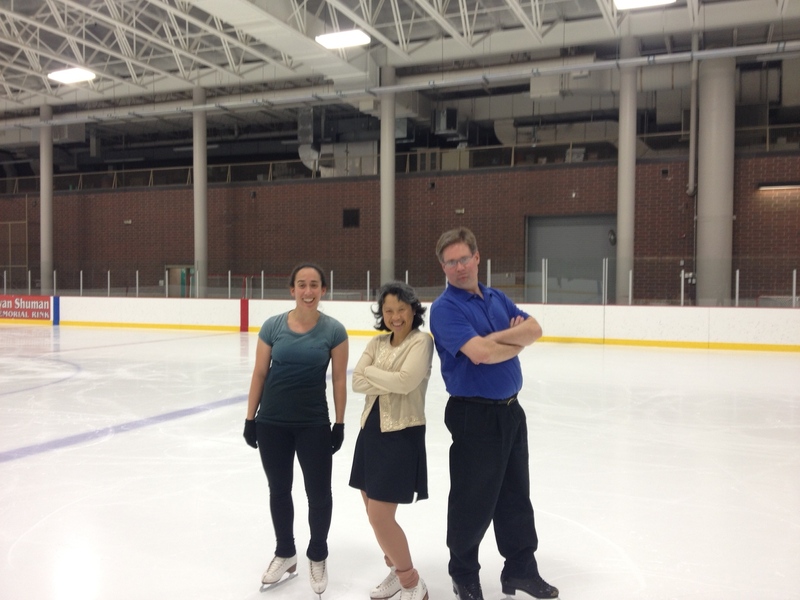 Hanging tough on the ice with Kristen and Marc. Categories: Uncategorized | Tags: skating costumes | Permalink. Thanks so much! I have really enjoyed writing it and discovering other fellow skating bloggers (I like your description of yourself as an “adult onset blogger”). This is so sweet, and I think you rock the sequins.